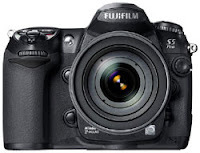 The Fujifilm FinePix S5 Pro is scheduled to ship in the first quarter of 2007, and the most obvious change for users of the company's past DSLR models is going to be the body. Fuji's S1 Pro was based on a Nikon N60 consumer film SLR, while the followup S2 Pro and S3 Pro models were Nikon N80-based. The S5 Pro takes a significant step forwards with a body that (although the company isn't officially stating derivations) is clearly based on Nikon's D200 digital SLR - and that brings with it a lot of benefits. Inside its all-metal body, the Fuji S5 Pro will now include 11-point AF, i-TTL flash metering, a 2.5" LCD display, Lithium Ion battery, a shutter with a rated lifetime of 100,000 cycles offering speeds from 30 to 1/8000 second, a slightly higher viewfinder magnification, 1/250 second flash sync, and lens aperture control of 1/3, 1/2 or 1 stop - all improvements over the predecessor camera.